View More In Serial Adapters - Page 6. 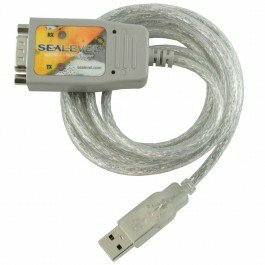 The SeaLINK 2105R USB to RS-232 serial adapter is the most reliable way to connect your computer's USB port to any RS-232 serial peripheral. Don't be fooled by cheap USB serial adapters. The 2105R uses authentic FTDI ICs to ensure years of glitch-free communications. There are increasing reports of counterfeit FTDI chips flooding the market. When you purchase a low-cost USB serial adapter, you can never be sure of the quality and reliability of the product. The 2105R is designed and manufactured in the US and backed by a Lifetime Warranty. That's a guarantee that vendors of cheap USB serial adapters simply cannot match. The 2105R is built using a ruggedized, overmolded, military-grade enclosure suitable for harsh environments. Perfect for a variety of mobile and industrial applications, the adapter is even recommended by high-end yachting companies to connect critical navigation systems. The 2105R features programmable baud rate and data formats with 128-byte transmit and 384-byte receive buffers to increase throughput and prevent data corruption. The USB serial adapter supports standard PC baud rates and high-speed communication to 921.6K. Sealevel SeaCOM USB software drivers and utilities simply installation and operation on Microsoft Windows and Linux operating systems. After installing SeaCOM, simply plug the 2105R into a USB port and the serial port is recognized as a standard COM port. WinSSD is a full-featured serial diagnostic utility that performs external loopback tests, toggle modem control signals and transmit test pattern messages. WinSSD also provides terminal emulation, bit error rate testing and throughput monitoring. The Port Manager utility allows you to change the Windows COM number, assign COM drivers to a specific port, and select custom data rates for Sealevel USB serial products. Easily connect your computer's USB port to any RS-232 serial peripheral. Glitch-free USB to RS-232 serial communications using authentic FTDI ICs. Widely trusted for connecting critical military and maritime navigation systems. Supports data rates to 921.6 Kbps and all modem control signals implemented on DB9M connector. Includes SeaCOM software for Windows and Linux. Made in the USA. Backed by a Lifetime Warranty and industry leading technical support.